Good Grooming is Healthy, Too! Why is good grooming important? Combing and brushing your pet can detect skin problems, fleas and ticks, abscesses, infections from matted fur, and life-threatening tumors. 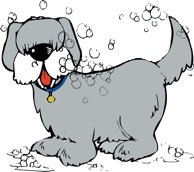 Bathing your pet can help treat common conditions such as oily or dry skin, and less common conditions, which can be treated with medicated shampoos. Bathing is also an opportunity to feel any unusual lumps, bumps or scales that may need veterinary attention that could save your pet’s life. Ear cleaning is necessary for prevention and detection of infection, ear mites, and any unusual redness, lumps, bumps, or swelling. Nail clipping can spare your pet from the pain and surgery of a torn nail, or a nail that grows back into the pad. Regular dental examinations and treatments can avoid more costly and painful procedures. Regular grooming can help family members who are allergic to pets. The Ridgewood Veterinary Hospital has always cared for your pets. Our new grooming staff is also ready to pamper your pets at our grooming salon, next door to our Midland Park office.